The book opens on a fevered summer night in Brooklyn, at the Maimonides Hospital, on 29 June, 1966. It is almost eighteen months before Chris Barnard attempts the first human heart transplant in Cape Town – and the South African surgeon has not even begun to consider any possible work in transplantation. Adrian Kantrowitz is different. For the past four years he has been working towards the "golden moment" of the first human heart transplant. He is acutely aware that his surgical rivals, Norman Shumway at Stanford and Richard Lower in Virginia, are also close to making history. Moving into strange and dangerous territory Kantrowitz is intent on saving the life of a dying baby – considered a 'prince' and future 'king' of the gypsy community who travel around Coney Island and as far north as Boston. The eighteen-day-old infant suffers from numerous deadly cardiac defects. Kantrowitz plans to transplant a new heart into his tiny chest – a heart that will be taken from a body born into oblivion. The donor patient had been born two days before as a victim of anencephaly, a rare condition that prevents the creation of a brain, or even the development of the upper skull in an otherwise normal foetus. .
At 11.45pm that tumultuous night, Kantrowitz stands silently over the small anencephalic body. His preference to remove a beating heart has suddenly been opposed by his own operating team. They have draped a towel over the donor baby's ruined head. The towel allows everyone around the operating table to focus on the perfect body of a new baby. Kantrowitz pulls back the towel. He wants his colleagues to see the nothingness of a body born with only half a head. Kantrowitz wants them to remember that they have another life to save. Harry Weiss, the silver-haired anesthesiologist, re-cloaks the baby's head with a towel. Once more, Kantrowitz removes the towel. "There is no brain," he says quietly. "There is no life." Howard Joos, the senior pediatrician, replaces the shroud. "You cannot take the heart, Adrian," Joos says. "This baby is alive. Only God can decide. Not you, Adrian. Only God." Kantrowitz is forced to wait for the baby's heart to stop beating at 12.21. They open the donor up quickly, without the need to cauterize or tie off the blood vessels, but the heart looks blue and inert. Its colour and stillness chills Kantrowitz - but he calls for the heart-lung machine. Kantrowitz knows from his work on hundreds of dogs that the little heart should turn a beautiful shade of pink as the muscle tenses and firms with an infusion of blood. This cyanotic heart, however, only changes from blue to purple. Kantrowitz tries to stimulate it but it only contracts spasmodically. They can still proceed with the transplant, and make some kind of history, in the hope of shocking the unpromising heart back to life. But Kantrowitz knows he will not be able to save the second baby. He turns away from the operating table so that he might find the parents. Kantrowitz tears off his gloves, cap and mask. They will want to see his face when he tells them the devastating news. From these heart-stopping moments, the narrative backtracks a decade to the mid-1950s. At the University of Minnesota, Norman Shumway and Chris Barnard are part of the same class studying under the great Walt Lillehei and John Lewis who pioneered open-heart surgery. They are inspired by their mentors – but the wise-cracking Shumway finds Barnard too brooding for his laconic tastes. Shumway eventually moves to California where, working with Richard Lower in a dark and leaky lab in San Francisco, he develops the art of successfully transplanting a heart from one living body to another in the late 1950s. Shumway's and Lower's work inspires Kantrowitz in New York and they all proceed steadily towards perfecting the technique so that it is feasible to consider a human transplant. After Kantrowitz comes so close to carrying out the first in the summer of 1996, medical history is changed when Barnard makes a chance visit to Lower's lab in Virginia. Having arrived from Cape Town to learn about kidney transplantation, Barnard watches with awe as Lower uses hypothermia and the surgical technique he devised with Shumway to coolly transplant a heart from one dog to another. Barnard whispers in Afrikaans: "My God, is that all it is?" Lower and Shumway had only been prevented from plunging ahead with a human transplant by their own scientific caution, justified concerns about the inevitable immunological problems and the reality that US legislation would not permit them to procure the heart of a brain-dead patient. Unshackled from such restraints in South Africa, where the government is more intent on bolstering apartheid, Barnard resolves that he will become "the first". Fifteen months later, in December 1967, little separates the four rival teams. Hours before Barnard carries out his defining operation, Kantrowitz has a donor and recipient prepared for surgery. Shumway is also ready – having come close to history a month earlier. Lower is just as prepared. By the time of Barnard's death, all the merits of his bold intuition and unequivocal commitment to his patients has been distorted alongside his crumbling face. In medical circles Lower and, especially, Shumway are revered for their perseverance in overcoming the immunological and legislative trials that made the early history of cardiac transplantation such a fraught and bloody business. Kantrowitz's intra-aortic balloon pump, meanwhile, extends the lives of hundreds of thousands of people every year. 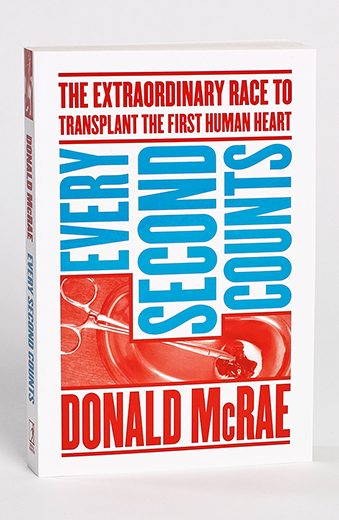 Shumway, who had been hurt for forty years by "losing" to Barnard, is the real "hero" of cardiac transplant history – and yet he argues that we owe much to the often reviled South African. "What Chris Barnard did in focusing the world's attention on brain death should never be forgotten," Shumway tells me. "He paved the way on that issue and it became central to our whole early struggle in transplantation. He won the race, all right, but we won the war."